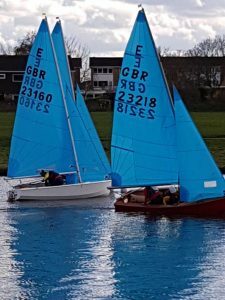 First sail at HSC on Sunday 17th March therefore the blog is back! This followed on from a cracking ‘Fitting Out Party’ at Chez Anderson on the Saturday 16th. Due to frantic winds driving the stream and causing consternation to the organisers we re-convened to a cosy and very cheery ‘Do’ there. Congratulations; the catering was excellent, the bar flowed and the auction was a cabaret with little and large! This first sail caught the tail end of Gareth, or was it or was it Harriet? The first race had only three takers; David, setting an example in his Solo, Brian in ‘Fencepost’ and a rather wary Phill with Graham in an Enterprise. The wind was gusty and from the west north west, sort of, with a lively stream. Hywell and Howard set a course with three gybes and then gleefully watched. The single handers sailed with confidence and aplomb, whereas the Enterprise lacked both these qualities, went round the wrong mark and then did lots of wearing round, apologies to Graham. In the afternoon we had five Enterprises out (silver star girls and boys) Ellen and Nigel in a beautifully renovated boat, Christopher and Brian, Sophie with Dad, Tirpitz with Colin and Amelia and me with Ra. Still three gybes in and a race for all seasons as we had sedate lulls, sunshine, hail, snow and some very strong winds of 20 plus knots. It was challenging but fun and no one went over. 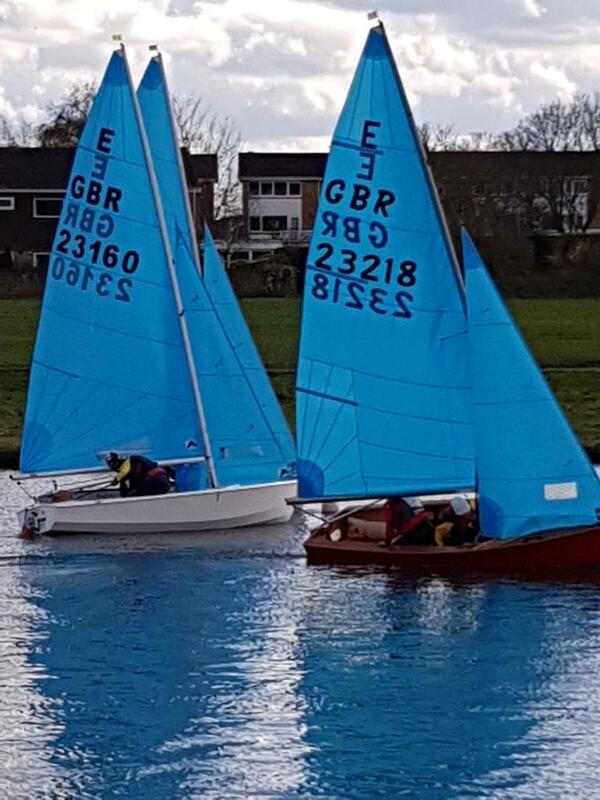 Three entered the handicap fleet; Keith with Graham in his GP, David in his Solo and Ben in Topper Bim Bom. Unfortunately after about an hour the wind died almost completely and most were becalmed. It was the most varied conditions I have ever sailed in, rather damp from above but the crew handled my new dangly pole expertly. Very nice tea by Susie and Michaela (they waited for the sailors too). Time Keeping by Margaret and the Apprentice and Bar by Nigel. Birthday drinks on John and Rosemary Shankster and Nigel did the announcements. It was so good to be back sailing! On Tuesday we said good bye to Clive Jenkins – a true trouper of the club. Good to have known you Clive but the Jenkins tradition lives on. If I missed anyone out sorry -still rusty.